What is a beard growth cream & oil? Beard growth cream, oil, serum, and sprays are products designed to help men cure issues they have growing a beard. They are to be applied topically and are not ingested. They typically claim to help with beard growth issues such as sparse or patchy beards and are supposed to make facial hair grow faster and to come in much thicker. Whether a beard growth cream, oil, serum, or spray, each product works basically the same in that the product is applied to the beard and the skin underneath. The only difference between a beard growth cream and oil is the consistency of the product. A beard growth cream has a creamy consistency whereas a beard growth oil or serum is a liquid. A beard growth cream is applied and massaged into the skin the same way as oil or serum. Some men may not respond to a beard growth cream so they may opt for a BEARD VITAMIN instead. Beard Growth Cream and Oil: Do they work? There are a growing number of beard growth cream, oil, and serums on the market each claiming that they can help men grow beards faster, repair patchy beards, and make beards look fuller and thicker. However, do any of these products really work as claimed? We decided to put each beard growth cream to the test. We spent the last 6 months testing the top beard growth cream products, oils, and serums on the market. Our results are shown below. 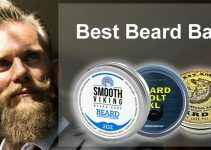 Unlike other sites that review beard care products, we actually have men test each beard growth cream and beard growth product we review to see if they really work as claimed. 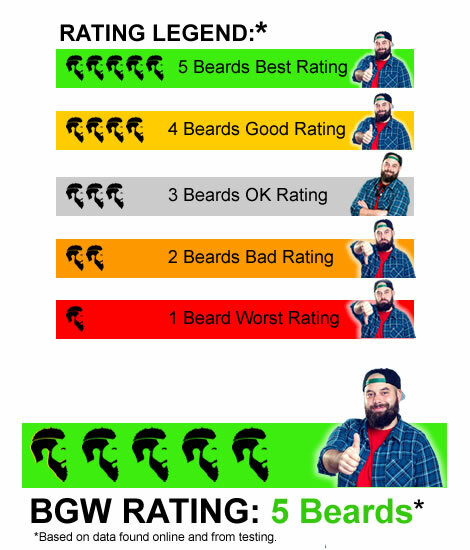 Our rating is based on a 1 to 5 BEARD scale. 1 being the worst and 5 on the scale being the best rating possible. First, we find men to test the overall effectiveness of each beard growth cream. Each product tester uses the beard growth cream for a minimum of two months. Then then they report back to us with their results. Second, we determine how easy the beard growth cream is to use. Is this something men will want to use every day or will it be to cumbersome? Third, for each beard growth cream, we scour the internet looking through thousands of user reviews. We then summarize overall user feedback. This feedback is then used as part of our total product score. We do this by utilizing various tools that help us to determine the quality of reviews found online. Many products on Amazon for example give away products for free in exchange for a review. At times this can result in an honest review. However, the majority of the time a review received in this manner skews the reviewer to leaving only a positive review. So we use tools to detect “low quality” reviews and this is combined with other variables to determine overall feedback score. Fourth, we consider the price of each beard growth cream. However, price is the lowest ranked factor. Price is really not that important. Men are looking for products that work. If a product has a low price but does not work, it is wasted money. On the other hand, if a product works well, it makes sense to pay a bit more. Effectiveness: 63% saw some results. Effectiveness: 87% saw some results. Effectiveness: 52% saw some results. With beards being so popular, many men are looking for a quicker way to make beard hair grow, or to make thin, patchy beards look fuller. Waiting for your beard to grow is as painful as watching paint dry, AND takes even longer, so any product like a beard growth cream that can give a man a small edge is bound to be popular. That why beard growth cream has become increasingly popular for men who want faster beard growth. Growther Oil by Beard Farmer is one such product. It’s not exactly a beard growth cream but an oil. Beard Farmer is a small, independent company and relatively new on the beard products scene. Growther Oil is one of the company’s signature products and top sellers. Beard Farmer claims that, in the product’s testing phase, 95 percent of users saw growth gains within three weeks. Growther Oil is a combination of plant oils. Olive oil is the first ingredient on the list, so it’s safe to assume that olive oil is the primary oil. There is nothing on the ingredient list that does not originate with some type of organic plant, which is good news for vegans. Even if you’re not vegan, it’s nice to know that something that is intended to be spread on your face does not contain any questionable chemicals and that all of its components come directly from the earth. Because there are some “flowery” ingredients, the scent is a little bit striking. Some users have said they don’t particularly like the smell, but many have also said that the smell dissipates pretty quickly upon application of the product. The instructions on the label say to use five to ten drops and work into beard hair. It’s critical to rub it right down to the skin, close to the hair follicles, as opposed to just slathering it over beard hair. This way, most of the oil is able to penetrate the follicles and the surface of the skin. The instructions go on to say that it should be left in for 20 to 30 minutes and then washed out, although it also says that, as long the user feels comfortable, it can be left in even longer. Unlike a beard growth cream, the product is pretty much 100 percent oil, so it feels a bit greasy going on. Olive oil tends to be greasy, so this is no real surprise. However, a lot of users report that it seems to get absorbed quickly. Just make sure you wash your hands after applying it or you’re apt to stain your clothes. You might want to avoid kissing your partner while it’s in your beard, at least until it gets absorbed, because it might leave a greasy residue that could be a bit of a turn-off. Some users have reported not only faster beard growth, but also a few other beneficial side effects. For many users, it makes their facial skin softer, and in some cases has helped to reduce “beard dandruff.” It also seems to make beard hair softer, shinier and generally more healthy-looking. One reviewer states that he uses the product not mainly for growing his beard, but primarily for the softness it produces. In another review, a professional barber says that he had carried the product in his shop for awhile before actually trying it himself. Once he did, he was hooked. Although it took a few weeks, he noticed a definite improvement in growth and appearance. It’s made in Michigan, so when you purchase this product you are supporting a US business and American workers. It contains all natural ingredients: no parabens or other questionable or potentially dangerous chemicals. It contains no fillers or preservatives. Essential oils are “cold pressed,” which ensures that they maintain optimal efficacy. A little goes a long way. Beard Farmer states that a single bottle will last one to two months. A bit of a funny smell due to some of the floral essential oils it contains. However, scent dissipates relatively quickly. 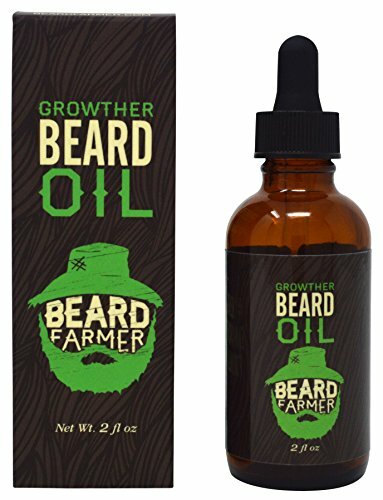 Fairly pricey: Beard Farmer Growther Oil translates to approximately $12.62 per ounce of product, which seems fairly steep. However, high quality oils are not cheap, so this price may be justified. If you can stretch a bottle to last two or more months, it might be worth the price, especially if you are happy with the results. You can order the product directly from Beard Farmer. However, its website isn’t super user-friendly. It is a bit difficult to navigate, and it seems to be lacking a lot of important details. Beard Farmer’s Growther Oil is definitely worth a try. It is important to note that Beard Farmer makes the claim on the product’s Amazon.com page that it “backs” the product “100 percent.” However, there were no details on the page or on the company’s website regarding what, exactly, that “guarantee” entails (i.e. a full refund). For that reason, the buyer should ask for the terms of the guarantee. If a beard is a symbol of manliness then every bearded man wants a full, thick mane. Thin or bald spots are definitely not desirable. For men who have been able to grow a beard but aren’t happy with its condition, or who seem to be battling thinness and patchiness, Maxx Beard Facial Hair Solution offers a promise of a thicker, longer, fuller beard, with noticeable results after just four weeks of consistent use. Maxx Beard Facial Hair Solution comes in a two-ounce (60 ml.) bottle which is enough product for approximately two months’ use. It is an oil and not a beard growth cream. It is touted on the package as a 3-in-1 solution for a thicker, healthier-looking beard. Maxx Beard Facial Hair Solution is available online through Amazon.com, eBay.com and a few independent sellers. It is hard to find in stores but may be available through specialty and boutique retailers such as salons and barber shops. The price varies depending on where you purchase it. The average price is about $43.00 per bottle, but some sellers listed it as low as $35 or as high as $75. The serum comes in a 2-ounce bottle. It is a serum and not a beard growth cream. The bottle is packaged inside of a box. Overall, the product is 1.4 x 1.4 x 5.1 inches and has a total shipping weight of 3.2 ounces. As previously mentioned, Maxx Beard Facial Hair Solution is branded as a “3-in-1” solution. However, neither the outside packaging of the product nor any of the online product descriptions that we checked spelled out what the “3” things are that make up the “1” solution. We can only guess that it is referring to the three major hair-growth ingredients/nutrients that the solution contains, which are Kopyrrol, Biotin and Niacin. They are also the first three mentioned on the package’s ingredient list, meaning that they are the most prevalent ingredients in the product. We decided to do some research on them and learn exactly what they have to do with hair growth. Kopyrrol– Of the three main ingredients, this was the one with which we were least familiar. We learned that Kopyrrol is the trade name for the chemical compound diamino pyrimidine oxide. It is similar to Minoxidil, a hair-growth formula that has been around for decades. (It is the primary ingredient in the hair growth solution Rogaine.) Kopyrrol works by dilating blood vessels around hair follicles so that more nutrients are able to be delivered to the root of the hair. This is believed to stimulate growth in hair follicles that have become prematurely dormant. Kopyrrol is a common ingredient in a number of different contemporary hair and beard growth products. Biotin– You may already know of this nutrient, especially if you are a body builder or take oral hair growth supplements. Biotin is one of the b-complex vitamins and is designated b-7. It is also sometimes referred to as “vitamin h.” Biotin helps the body metabolize glucose and process proteins. It is known to help make hair and nails stronger, shinier and healthier. Interestingly, however, it is not very well able to be absorbed through the skin and works much better when taken as an oral supplement. Its inclusion in Maxx Beard Facial Hair Solution or any other topical hair growth solution is more of a marketing gimmick than anything else. Consumers automatically associate biotin with hair growth so it looks good on a product label, but if it’s only being applied to skin it is little more than a filler in any topical solution. Niacin– This is another b-complex vitamin, tagged as b-3. Niacin is a great overall vitamin for a variety of different body processes. It helps to regulate cholesterol and contributes to heart health. Niacin’s primary function in the body is to transform carbs into energy. This process helps to deliver greater blood flow to hair follicles, thus delivering more nutrients and oxygen which, in turn, stimulate hair growth. But…. don’t get too excited. Like biotin, niacin also doesn’t get absorbed very well through the skin and is much more effective as an oral supplement. That being said, it is a finicky supplement, because too much of it can damage organs like the liver. So, again, niacin looks appealing on the Maxx label, but may not be making a significant difference to hair growth when applied topically. There are a number of other ingredients in Maxx Beard Facial Hair Solution. They only make up a small percentage of the overall contents of the product. However, they are mainly ingredients that are healthy for the skin and hair and will help to add softness and shine. Emu oil, saw palmetto extract, argan oil and nettle extract are a few of these, and they come from natural sources which is an added benefit. The product also contains castor oil which is not only good for the skin but also helps deliver nutrients to the hair follicles, which stimulates growth. The product does contain two chemical additives: ethanol and propylene glycol. Both are approved for use in cosmetic products by the FDA (in low proportions) and they are common additives in a variety of cosmetic products. Their use is typically for reasons of product preservation, binding ingredients together and keeping them from degrading, separating and losing their texture. These two ingredients are last on the product’s ingredient list, meaning they are the least prevalent ingredients in the formula. 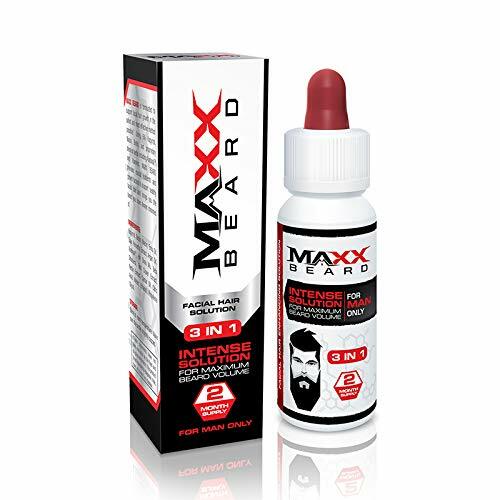 Maxx Beard Facial Hair Solution comes in a 60 ml/2-ounce bottle with a dropper built into the cap. The user simply applies a very small amount. Typically, a drop or two is enough, but it also depends on how thick or long your beard is already. The best way to apply the product is to drop the serum onto your fingertips and rub it into your face. The serum must be rubbed right onto the skin (as opposed to onto the hair only). A little goes a long way, and you should be able to spread it over the entire surface of the skin of your beard. (It also works on the mustache area.) Be sure to pay special attention to spots that are sparse, thin or patchy. Concentrate on those areas particularly and rub the product in thoroughly. The product needs only to be applied once daily. It is best to do this at nighttime, just before bed. This way, the product can work its magic while you sleep, without having to worry that it will get rubbed off or washed away before it has a chance to work. Be sure to wash your hands thoroughly after applications, because the product has the potential to grow hair on whatever part of the body it happens to rub off on. If you follow the directions and limit your use to the recommended dosage, the bottle should last you approximately two months. Be sure to read the warnings on the package regarding use of the product and certain medical conditions. You must also take care to keep the product out of reach of children, and away from pregnant women. This product seems to be a popular product on Amazon. Generally speaking, users seem to indicate some success with the product, although it takes time. Many users had to use the product consistently for several weeks to a couple of months to achieve a significant change, so patience is key. Many reviewers started out skeptical that the product would work, but changed their minds after consistent use. Produces minimal to good results for most users. Contains some natural plant ingredients. The product is comparable in price to competing brands of beard growth formula (as long as you can find it at a price on the lower end of the range). Buyer may get a satisfaction, money-back guarantee if purchasing the product on Amazon.com or other seller with a satisfaction guarantee. Small packaging so shipping costs should be reasonable for most buyers. Reports of itching and burning after using the product. Not every user gets satisfactory results. Biotin and niacin not readily absorbed topically so they don’t add a lot of value to the product. May not be suitable for households with young children or pregnant women. Large number of low quality reviews which skews our view of this product. Because the price of this product seems to be all over the map, it is advisable that you do a little bit price comparison before dropping it into your online shopping cart. (You can do a quick and easy price comparison using Google Shopping.) If you are not sure you want to spend money on a product that may or may not work for you, purchase it from a seller that offers a strong money-back guarantee (preferably 30 to 60 days). That way you won’t lose money if indeed you aren’t happy with the results. That being said, you should also research other beard growth products and beard growth cream solutions. Specifically, read user reviews. The users who wrote the reviews on Maxx Beard Facial Hair Solution “Pros” that we read were not overly-enthusiastic about the product. Most seemed to experience only average or minimal hair growth. There may be other products out there that have better user reviews and cost the same or less than Maxx Beard Facial Hair Solution. Also, this product seems to have a large number of low quality reviews which skews our view of this product. One of the biggest complaints from men trying to grow beards is that, as soon as they get a few days growth, they start noticing sparse patches. These patches either seem to grow hair more slowly than the rest of their face, or they don’t appear to be growing hair at all. The Godefroy company has developed a beard growth cream product that addresses this all-too-common problem. The Godefroy company has been around for more than two decades, is located in Texas and is a family-owned company. It specializes in hair color and hair growth products. Its products are used mainly by professional salons, particularly its hair color products. It also sells consumer products aimed at various types of hair growth, particularly eyelashes. It makes sense that the company would delve into the market of men’s facial hair, especially considering its steady success with its other products. According to the manufacturer, this beard growth cream can help fill in patchy, sparse areas in the beard and mustache area. They also claim it will make your beard softer, shinier, fuller and healthier-looking beard. The beard growth cream itself is packaged in a small tube containing .51 fluid ounces of serum. The tube is sold inside a box that measures 4 x 0.7 x 4 inches and weighs 1.6 ounces altogether. Godefroy Thick Beard and Mustache Growth Serum boasts right on the front of its packaging that it is “made with Jamaican castor oil.” It says it is a serum but comes in a tube and goes on more like a beard growth cream. Closer inspection of the ingredients reveals that it also contains “plant extracts,” an ambiguous term which can be hard to define and could come from just about any plant source. It could even refer to the castor oil itself, which is essentially a plant extract. Since Jamaican castor oil seems to be the product’s big selling point, we did a little bit of research to find out what castor oil in general, and Jamaican castor oil specifically, has to do with hair growth. Castor oil is derived from castor beans. If you are in the forty-plus age group, you might be more familiar with castor oil as a nutritional supplement rather than a hair-growth stimulator. This is because castor oil is very high in nutrients, many of which are hard to find in other sources. Castor oil contains protein, vitamin E, minerals and omega 6 and 9 fatty acids. It is also one of a small handful of sources which contain high levels of ricinoleic acid, the source of its fatty acids. When vitamin supplements began being manufactured and sold on a commercial scale, there wasn’t really a need anymore for taking castor oil to supplement a diet. This was wonderful news to millions of children whose parents fed them a daily dose, since castor oil has a distinctive and unpleasant taste. However, castor oil’s use as a topical agent has grown in popularity. Vitamin E and omega 6 and 9 are both excellent for skin and hair health. Thus it has become a more common ingredient in skin and hair treatments. There are two common types of castor oil. “Regular” castor oil is pale yellow in color and is what most people think of when they think of castor oil. “Jamaican” castor oil comes from Jamaica and is a black castor oil. It sounds more exotic to many consumers than ordinary castor oil (who doesn’t think of glorious blue water and miles of white sand beaches when Jamaica is mentioned?) which is one reason why cosmetics manufacturers use it. However, it is more of a marketing gimmick than anything exotic. The reason it is black is due to how black castor oil is processed and what else is in it. Traditional castor oil is processed using the “cold press” method. Without going into too much detail, it is a way to process plant extracts without using heat or chemicals. As a result, the extracted oil retains almost all of the same nutrients it started out with as a bean. Black castor oil, on the other hand, is produced using heat and chemicals. It results in a different yellow shade of oil, to which is then added ash generated during the heating process. This is what turns it black. So, essentially, black castor oil is less potent and contains more impurities than regular castor oil. When put in those terms, black castor oil sounds much less exotic. However, cosmetics manufacturers use it because (surprise!) it’s cheaper. As far as ash goes, if it does add any beneficial nutrients to the oil, it is only very minute traces. The potential toxicity of ash is based on the contents of what the ash came from and the transformation it went through during the heating process. Not all ash is toxic, but it’s safe to say that it really isn’t a vital ingredient in ANY cosmetics product and, in the end, is more of a filler than anything else. That being said, we are not assuming that Jamaican black castor oil is bad for you. Just keep in mind that, when you hand over money for Godefroy Thick Beard and Mustache Growth Serum, you’re paying for filler and impurities along with the good stuff. Castor oil does not cause hair growth, per se. Rather, it stimulates blood circulation in the skin. This increased circulation is what stimulates hair growth. However, there is no guarantee that it will work for all users as a beard growth stimulator. Some users find the product very helpful, some find it mildly helpful while still other users say it doesn’t help them at all. Individual hairs grow out of follicles. Follicles not only go through production stages (including a “rest period” when hair doesn’t grow at all), they have a particular life span. That lifespan is determined largely by genetics. If your genes have told your follicles that their life is over, increased blood circulation from castor oil is not going to wake them up (although there are certain other chemicals that can, namely minoxidil). However, if your follicles are productive but a little sluggish, Godefroy Thick Beard and Mustache Growth Serum might do the trick. To use the beard growth cream, you must start with at least one week’s hair growth. Wash and dry your face and beard hair before applying the product. Using warm water helps to open up pores so that more of the product can penetrate the surface of the skin. Apply a small amount (squeeze the tube until about half an inch comes out) to your fingers and rub it into your beard and skin. Be sure to wash your hands afterward. It is best to apply the product just before bed so that it has all night to do its work. Wash it out in the morning and repeat the ritual for about 2-4 weeks. If you haven’t noticed a change by the end of the fourth week, let your follicles rest for a week and then start another round. If you aren’t experiencing new growth by then, it’s a good sign the product isn’t for you. There are a few different sellers of this product. 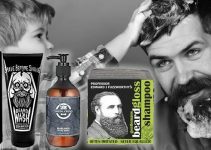 Of those who have submitted a review of the product, a majority have reported anywhere from a slight increase in hair growth to noticeable new fullness in their beards. However, there are also a significant number of users who have claimed that the product either didn’t produce noticeable growth or didn’t work at all for them. The Godefroy company has a strong and positive reputation in the market and many of its products have been on shelves and used by satisfied consumers for decades. It is an American, family-owned company. Your purchase helps to support American workers and the US economy. The beard growth cream is relatively inexpensive when compared to similar products from competing brands. Buyer may get a satisfaction, money-back guarantee if purchasing the product on Amazon.com. Information about the ingredients this beard growth cream contains is sketchy. Jamaican black castor oil contains ash, so you aren’t getting a “pure” beard growth cream. It also means you are paying for additives and fillers. The beard growth cream probably won’t work for all users. For others, the benefits may be negligible. If buying the product offline the buyer may not be able to get his money back if the product doesn’t work. 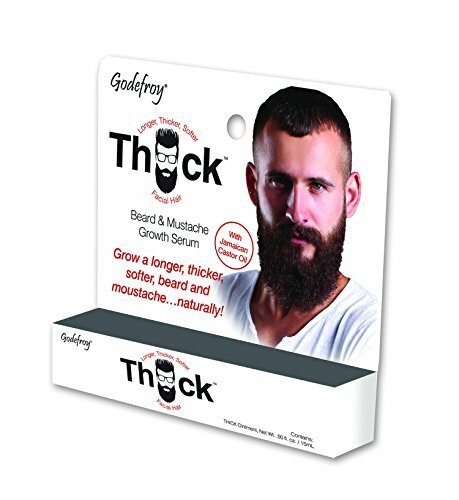 If you decide to give Godefroy Thick Beard and Mustache Growth Serum a try, we recommend asking a lot of questions about the product first. Make sure you have a very clear understanding of what is in the product. It’s also not a bad idea to do your own research about the pros and cons of black castor oil and its ash content. If the seller is vague or can’t answer questions about the ingredients, call the Godefroy company directly. If you’re still ambivalent or have qualms, get a doctor’s opinion. If you do decide to try the product, you won’t have a lot to lose if indeed it turns out not to work for you. The product is available both on and offline. You can find it on Amazon.com. If you buy it from an Amazon.com seller, you are more likley to get a money-back guarantee than if you purchase it in a drug, grocery or department store. If you are able to try the product and get your money back if you don’t like it or it doesn’t work, you won’t lose any money, just the little bit of time it takes to ship back the unused product and then wait for your refund. If you buy it from a source that won’t guarantee a refund, at least you aren’t losing much, especially considering some hair growth products can cost more than twenty and up to 100 dollars for one or two treatment rounds. Investigating Beard Fuel XL was no easy task. It isn’t widely available, either on or offline. 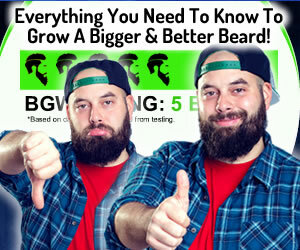 There are a few listings for it on Amazon.com, and we found it on its manufacturer’s website, BeardGrowXL.com. The site itself was minimalist in design, but contemporary and tasteful. 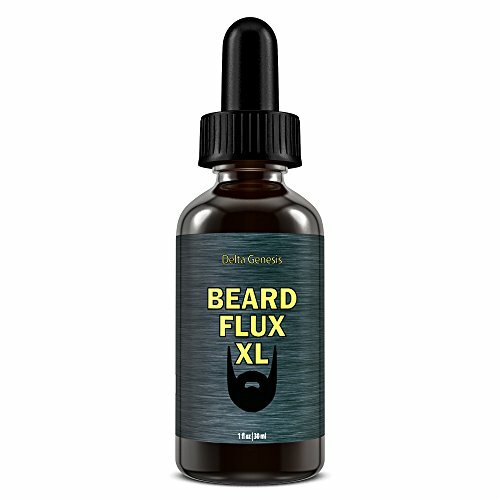 Apparently, the company only makes two products: Beard Fuel XL Serum and Beard Grow XL vitamins/nutritional supplement. Beard Fuel XL is not a beard growth cream but a serum. The serum is for external use, the vitamins are for internal use. The idea is that by using the two products together, you double your chances of growing an enviable beard. There were a couple of things about the website that we found troubling. First, there is only a vague reference to the actual maker/seller of the product, Delta Genesis. Although it claims to distribute products in at least 16 countries, there is no reference to where the company’s headquarters are actually located, or if the company is even a US-based company. There was a second thing we couldn’t help but notice very early on in our online investigation of this product. While the product description stated “100 percent pure and organic” (always a good thing), there was no mention anywhere that we could find what those “pure and organic” ingredients actually were. All we wanted was a simple ingredient list and couldn’t find it on any sites that sell Beard Fuel XL. This made us very suspicious right up front. Why wouldn’t a company provide a list of ingredients up front for one of their products? Did the company have something to hide? It seems perfectly fair to want to know what is in a product that is designed to be slathered on one’s skin and hard-won beard before one purchases it. What if I have allergies to certain ingredients that might be in it? What if it contains jet fuel? What if it contains dye that will turn my beard green? Oh wait, that’s right: it’s organic. Probably no dye or jet fuel but, still. In this day and age almost every consumer wants to know what is in a product before buying it. So it seems fair to expect this information to be readily available, but it wasn’t. Instead, we had to do a bit of outside digging. As it turns out, Beard Fuel XL contains one ingredient, and one ingredient only: 100 percent pure cold-pressed Argan oil. Great! Argan oil is, in fact, really good for your hair and skin. (We’ll tell you why in the next section.) So why did it seem as though the company that makes the product was reluctant to put this information on any of its online marketing paraphernalia? We could only think of one reason: to mislead customers. “How is this misleading customers?” you might wonder. We don’t believe the company is being deceptive. The product truly is made solely from Argan oil which is, again, an excellent skin and hair conditioner. What they fail to tell you is that because the product is straight Argan oil with no other ingredients, pure or chemical or otherwise, what you’re really paying for is Argan oil that is being marketed at men with beards. The truth is that straight Argan oil is very common and can be purchased both on and offline. This or any company could fill a brown bottle with Argan oil and call it anything they want to: beard formula, hair formula, skin formula, facial moisturizer, body moisturizer, leg hair softener… literally anything that has to do with skin or hair. That’s because it’s true: Argan oil is a highly versatile oil that’s hypo-allergenic, safe for most skin types, is easily absorbed by the skin and hair and yet doesn’t leave behind a greasy feeling. 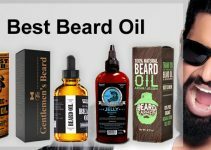 So while it is indeed great for your beard, at the end of the day, it is just Argan oil, and there are many sources of Argan oil that are much cheaper than the $49.99 price listed for this product on BeardGrowXL.com for one single ounce of product. We just about had a heart attack when we saw that price. Almost fifty dollars for a single ounce of Argan oil. Incidentally, you can walk into just about any salon or upscale barber shop and find pure cold-pressed Argan oil products for less than half that price per ounce. It’s even less expensive online. A very quick search on Google Shopping led us to find several pages of nothing but pure Argan oil products, and hardly anyone even came close to 50 dollars per ounce. Only one other online seller came close at 48 dollars per ounce. The median price for most of the sellers was about 14 dollars for a one-ounce bottle. However, we found several sellers that carried it for under ten dollars per ounce, with one seller listing it as low as five dollars per ounce. Five dollars! That is one-tenth the price of Beard Fuel XL for the same, single ingredient. Beard Fuel XL comes with one ounce of product in an amber, dropper-top bottle. The product’s shipping weight is approximately 2.4 ounces. As already stated, the product is made of cold-pressed Argan oil. Argan oil comes from the Argan tree (Argania spinose). Specifically, it is extracted from the kernels which are located inside the nut, which is located inside the fruit that grows on the tree. The Argan tree is native and endemic to Morocco. Once upon a time, it was the only place in the world that Argan oil could be obtained from. However, Argan trees are now being farmed in other warm weather and tropical countries in order to meet the growing worldwide demand for Argan oil, particularly within the cosmetics and spa industry. This is why you might see some cosmetics products that contain “pure Moroccan Argan oil” while others simply contain “Argan oil.” Moroccan Argan oil is still harvested and produced as it has been for hundreds of years in Morocco: by hand, collected by independent farmers and pickers. Moroccan oil is considered to be superior to other Argan oils for its quality as well as for the way it is harvested and produced. However, non-Moroccan oil is still a quality product, as long as it is cold-pressed (as opposed to heat/chemical extracted, which robs it of most of its nutrients). Argan oil can be used both topically as well as internally, in the same way North Americans are used to using olive oil or corn oil. In fact, it has nutrients which are similar to those in olive oil, but with a different flavor and texture. It is that unique textural makeup that makes it so desirable for cosmetic use. It is lightweight and easily absorbed through the skin. If you were to put olive oil on your beard, it would be a great conditioner, but it would also leave your beard feeling greasy. Argan oil, on the other hand, doesn’t feel greasy at all. Argan oil helps to stimulate blood flow. This increased circulation is what helps grow hair because it feeds more oxygen and other nutrients to the hair follicles of your beard. That being said, Beard Fuel XL and Argan oil in general is not a magic hair growth formula. It won’t grow hair overnight, and some users may not notice any significant growth at all. It also won’t grow hair where hair follicles don’t already exist, so you won’t have to worry about it getting on your hands or other parts of the body. In fact, Argan oil can be used anywhere on your body and is an effective skin softener and conditioner. Beard Fuel XL comes in a stopper bottle. To apply the product, simply drop two or three drops onto your fingers (a little bit goes a long way). Run your fingers through your beard, massaging in order to work the product right onto your skin in an even manner. Work throughout beard hair, styling as you go along. The manufacturer recommends applying the product once per day, and it can be done either in the morning or at night, depending on your preference. It doesn’t require rinsing out. However, because Beard Fuel XL is pure Argan oil, a natural plant extract with no chemical additives, you can use it more than once a day and use it long-term with no adverse side effects. Customers who have purchased Beard Fuel XL have been largely pleased with the product. One of the most prevalent comment by users is how well Beard Fuel XL softens beard hair, even beards that are normally coarse and dry. Overall, users who purchased and reviewed the product gave it strong approval. Excellent reviews and high satisfaction from users. Natural, plant-based product with no chemical or artificial additives. Oil is extracted using the cold-press method so that most of the original nutrients are retained. No strong or unpleasant scent. Effectively softens beard hair and skin. Lightweight and easily absorbed by the skin. No greasy feel after application. No adverse effects associated with long-term or repeated use. Safe even for households with children. Expensive compared to other products made of pure cold-pressed Argan oil. May not necessarily provide faster, thicker or better beard growth which is what Beard Fuel XL is being marketed for. Lack of detailed product information (specifically on product ingredients) on the company’s website. If you want to try Argan oil for your beard, go for it. However, we see absolutely no reason to buy Beard Fuel XL. Instead, take 50 bucks out of your wallet, pull off a ten-dollar bill, and put the rest of the bills back into your wallet. Order Argan oil online and take your significant other out for a casual dinner or fancy lunch with the remaining 40 dollars. Or go play a round of golf. You might even have enough left to buy a beer at the clubhouse afterward. Whatever you do, in Heaven’s name do not spend fifty dollars for Argan oil with Beard Fuel XL. You’re being overcharged simply because you’re male. Now, here is the other thing to remember: whether your Argan oil costs fifty dollars or five dollars an ounce, it is not a miracle hair growth solution. What it will do is give you an unbelievably soft, touchable beard and smooth skin, and it will keep it soft all day long. It will also give it an amazing shine. Best of all, it won’t feel greasy like a lot of other oils do. However, it’s not like Jack’s magic bean. Your beard will not grow in over night. Chances are that if you want to achieve fuller growth using nothing but straight Argan oil, it’s going to be months before you notice a difference. The good news is that there is absolutely no risk associated with long term use of Argan oil. You can use it every day for the rest of your life if you want to and you’ll never have to worry again about a dull, dry, lifeless beard or itchy skin. Beard Growth World is a participant in the Amazon Services LLC Associates Program. If you decide to purchase something through any of our links we get a commission. Using products to help you develop better beard growth should be just part of your overall plan to attack hair growth issues. One of the most important factors is your diet. Eating a healthy balanced diet will set you on the right track to growing a thicker fuller beard. 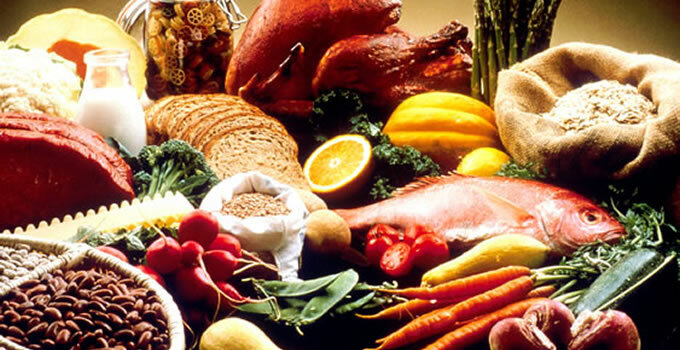 READ OUR ARTICLE Five Foods To Eat To Make Your Beard Grow Faster.